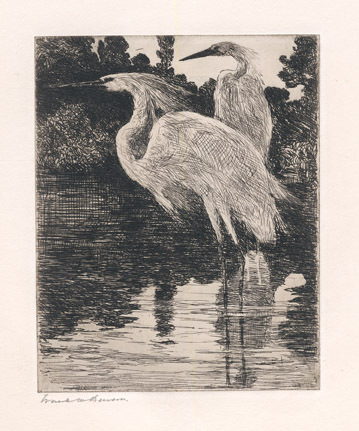 Today we have a new P/P post, featuring two prints of herons. 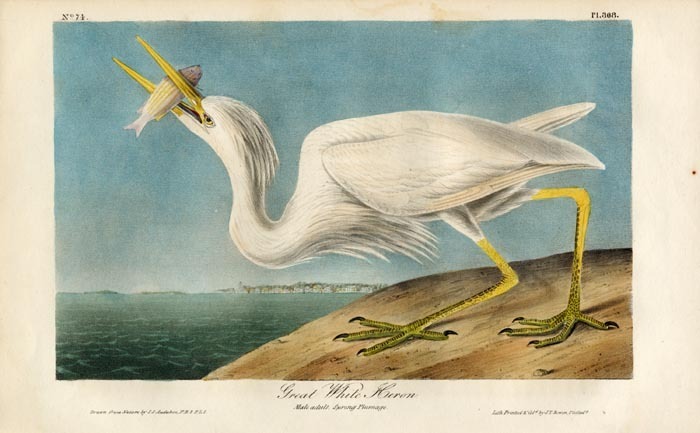 The older print comes from the first octavo edition of Audubon’s The Birds of America. After the original elephant folio edition was completed, Audubon decided to produce a more affordable edition and employed a lithographer from Philadelphia, J. T. Bowen, to do the job. Bowen and his team created a smaller octavo edition, which was issued to subscribers in seven volumes and completed in 1844. Five more octavo editions were completed through 1877. The octavo edition used the same text from Audubon and MacGillivray’s earlier Ornithological Biography, the accompanying text to the elephant folio edition, but increased the number of plates to 500. They did this by separating several of the birds that had appeared grouped together in the octavo edition. The 20th century print is by Frank Benson. Benson was born and raised in Salem, Massachusetts. He spent a great deal of time in the salt marshes that surrounded his coastal town studying, as well as hunting, various waterfowl. He painted his first oil of shore birds at the age of twelve. At nineteen, he attended the School of Drawing and Painting of the Museum of Fine Arts, Boston. While attending the school he produced his first etching, “Salem Harbor.” In 1883, he traveled to Paris to study at the Academie Julie and for the next thirty years devoted his artistic talent to painting and watercolor. In 1912, at the age of fifty, he again began to produce prints. At first, these prints were portraits, then the subject shifted to waterfowl and nature oriented subjects, totaling over 355 various prints before his death in 1951. Today, Benson is considered the founder of the school of American sporting art and his prints are some of the most desirable. Image on Left: Great White Heron. (Male adult, Spring plumage). Pl. 368. By John James Audubon. Lithograph handcolored, 1840-44. From the first octavo edition of The Birds of America. Printed and colored by J. T. Bowen, Philadelphia. Image on Right: Snowy Herons. By Frank W. Benson. Etching, 1917. Edition 150.